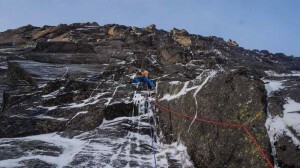 On Saturday I lost my winter climbing 2014/15 virginity, and boy was it good! 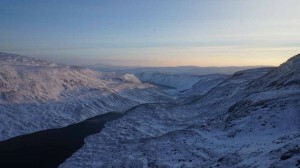 Guy and I headed in to the Glass Allt bothy on Friday night ready for an early start the next morning in the Dubh Loch. There was too much snow to cycle in, so it was walking all the way, and on the Saturday morning the approach to the coire was home to some very deep snow in places. 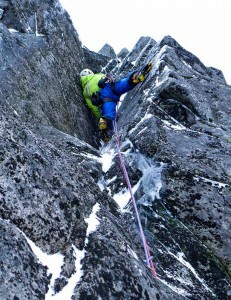 But after a 2.5 hour slog, we reached the bottom of the buttress and geared up for the days antics. We didn’t really know what we were going to do, as the conditions might have swayed us one way or the other, but eventually we opted for a look at Culloden. 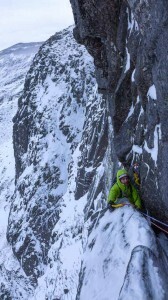 This route had had a winter ascent a few years ago buy Ian Small, Tony Stone and Gordon Lennox, and they said it packed a punch and was graded IX/9. This sounded like it was just what the doctor ordered to start off the winter season and blow away any cobwebs that might be lurking about! Guy offered me the crux second pitch, which I gratefully accepted, so he took the first and third pitch up the big steep face of the broad terrace wall. He swiftly dispatched the first pitch with little struggle and after I had seconded up, it was good to see that the route was going to pack it in. The second pitch was a steep wall off the belay then a hanging techy corner. The initial moves were hard and committing, and the upper corner was hard to get situated into, then became very enjoyable to climb. 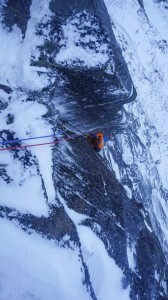 The pitch was pretty sustained and the climbing was worthy of outstanding status! It was really fun, and after I had found a belay, Guy seconded up with a big smile on his face. Me leading the second pitch. The next pitch was also very sustained and after Guy had made some pretty committing moves away from an marginal nut runner, he proceeded to get his axe well and truly stuck in a crack placement. After some frustrating struggling to remove it, and to no avail, he lowered down a loop of rope and I passed him my axes. 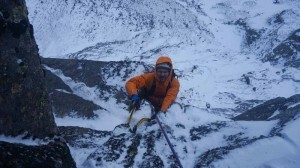 Still well above his last runner and on very marginal foot placements, retrieving new axes was a feet in itself! But finally he was moving again, and he eventually made it to the belay with little more fuss. I was able to retrieve the stuck axe on my way up seconding the pitch (after a bit of a battle and some inventive levering) and after that it was a small easy, yet still fun exit pitch to the top of the crag. All that remained then was the small inconvenience of the long walk back to the car. But all in all it was awesome to get out in the snowy hills again, especially when my last winter season ended a little abruptly due to injury, but everything seams to be good now so watch this space for more winter antics and updates.